o	The learner will study and examine the ancient roles of women in Asia. o	The learner will study and examine modern day roles of women in Asia. o	The learner will translate the poem Fu Xuan Women. o	The learner will write a letter to a woman in Asia exploring and expressing his/her feelings regarding the roles and status of women within the country. o	The learner will predict the future roles of women in Asia. o	Fu Xuan Woman Poem by Arthur Waley. o	Laminate four copies each of the reading materials on China, India, North/South Korea, Japan and Vietnam. This may seem like a great deal of work, but it will save you preparation time in the coming years. The room will have been set up in ten centers, placing an article for each center. Since there are only five countries, you will have two centers per country. o	Place a stack of note cards at each table. o	One lunch bag per table. o	Place sticky notes at each table. 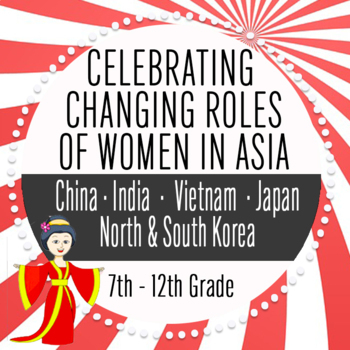 Find out what each group knows about women in Asia before you begin this lesson. Divide them into teams of four and present the topic. Give each team a stack of sticky notes. Ask them to brainstorm and list as many ideas or questions as they can come up within five minutes. They will be given 8 minutes to read their activity and 2 minutes to complete the center activity. Once eight minutes have passed, the instructor will notify the class by ringing a bell or using another sound. The remaining two minutes will be used to complete the 2-minute activity (see below). Once the warm-up reading center’s activity is complete, the instructor will pick up the bags and will dump them all into one bag and shake them up. Explain to students, matchmaking is a process of making a match of an unmarried man and woman by a matchmaker, which is a common way of choosing a spouse in ancient China and other Asian cultures. The traditional Chinese wedding is much involved with "matchmaker", or in other words, marriage introducer. In Zhou Dynasty several thousand years ago, the post of "official matchmaker" was set up for management of marriage, supervising and urging young people old enough to marry or widows and widowers to marry. Later, the meaning of "matchmaker" extended to all persons or events that act as a go-between of marriage between two families. Today matchmaking is still seen as the proper way to marry by the older generation. You will find that parents will trade a person’s resume and will compare it to their child’s to determine if it is a good match. However, there has been given more freedom, from one generation to another, of individual choice to choose a partner. Tell students they are going to play a game called “Matchmaker”. Examine the Fu Xuan Woman Poem by Arthur Waley in how it relates to the role of women in Asia. 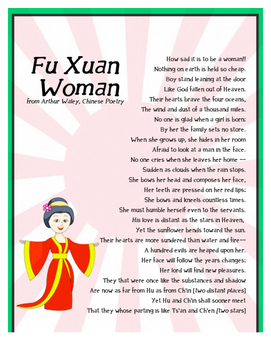 Have students work in groups of two to read and examine the poem Fu Xuan Woman. Provide each student with a Question for Thought Activity Sheet (Included). Give students 15 minutes to read and examine the poem, also attempting to answer the Questions for Thought. 1. What are some key words used to describe women of ancient China? 2. In lines 3-4, to what are boys compared? 3. What do lines 7 & 8 express about how girls are looked upon by families? 4. What does the Fu Xuan’s poem depict about the life and status of women in ancient China? 5. In what ways do the roles of women today differ from the images expressed in this poem? 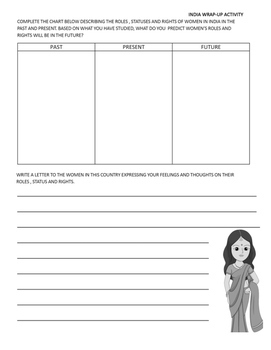 Provide each student with wrap-up activity sheet of a female from one of the countries studied. They are to write a letter to the female expressing his/her feelings and thoughts regarding the roles and status of women in that country, as well as celebrating how the roles and status of women within the country has improved. In addition, have each student express how he/she feels women’s roles will change in the future. Allow for follow-up discussion. 1. What was life like for Asian women in the past? 2. What is life like for them today? 3. Do you think much has changed in the roles and statuses of women in Asia? 4. Based on what you know about women in Asia, what do you predict will be the future of these women? 5. What do you think needs to be done to improve the situations of women in Asia? a cultural issue. Do you think those in the culture are willing to change and allow more rights for women? Permissions are given to the purchaser to made modifications to the game board using the Word document provided in the zip fie. No other modifications may be made to this document. © Martha Boykin Products. All rights reserved. Purchase of this product grants the purchaser the right to reproduce pages for classroom use only. If you are not the original purchaser, please download the item from my store before making copies. Copying, editing, selling, redistributing, or posting any part of this product on the internet is strictly forbidden. Violations are subject to the penalties of the Digital Millennium Copyright Act.